I’m Adrian Atley, an Enterprise Service Architect in DWP Digital. Across government large amounts of data are created, securely stored and processed. However there is currently a lot of duplication across services and organisations, even where those services share the same users. DWP, along with many other departments, has committed to improving the use of data to drive more effective and efficient services. That’s why we worked with Warwickshire County Council (WCC) and the Government Digital Service (GDS) on a ground-breaking pilot project to help disabled people in Warwickshire renew Blue Badge parking permits online. Along with my former colleague Alice Carter, we collaborated on a pilot that helped us learn lessons about how to apply a conceptual pattern, ‘user-centric trusted attribute exchange’. This model helps put citizens in control of how their data are accessed to achieve the service outcomes that they want, in order to give them a faster service outcome and also to lower costs and risks compared with previous data centric approaches. 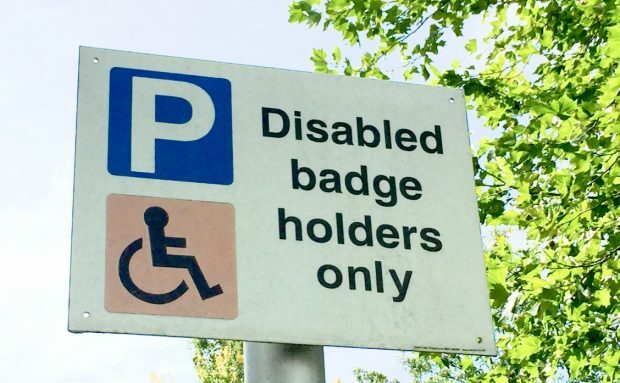 The Blue Badge pilot broke new ground in a number of ways; it was the first use of GOV.UK Verify with a local authority where members of the public could access the service. It was also the first time that users of a public facing service could experience the benefits of the attribute exchange approach. This was an exciting piece of work which meant exchanging the data needed for the service online and in real-time, with the user present, and with their full knowledge and permission. This approach has huge benefits for government and the user: faster services, reduced costs, improved use of data, as well as reduced risk because the minimum data required is passed between services. It also showed how we could improve people’s experience of renewing their Blue Badge online, without the need to spend time bringing, scanning or sending any identity and eligibility documents in person. 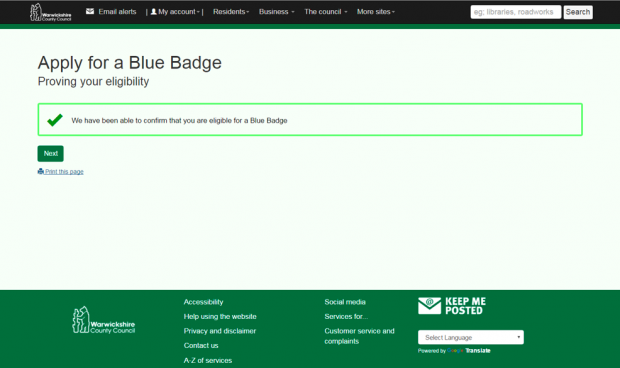 Warwickshire County Council worked with GDS to integrate their new online Blue Badge service with GOV.UK Verify in order to prove the identity of the applicant. When applying online to renew their Blue Badge, the user was asked to give permission for their eligibility for the Badge to be checked against DWP data in the model of user-centric trusted attribute exchange. The online check let the user know the result immediately, an improvement from the current process which can take weeks to process. 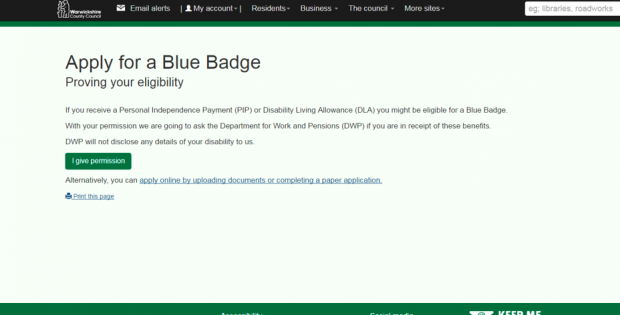 We worked with DWP's operations teams to allow the Blue Badge online service to be able to access the eligibility ‘flag’ attribute of 750 potential applicants, data minimised and derived from authoritative DWP data (with the fully informed agreement of those applicants). We also made sure we were strictly compliant with our obligations under the Data Protection Act during this work. The results from the digital Blue Badge private beta service were very encouraging. Even though there were other digital channels available the pilot service achieved a completion rate of close to the average for live systems. The pilot proved in a live setting that users were happy to be given the choice of how their data should be accessed to achieve the service outcome that they want. This was a significant test of the attribute exchange model. 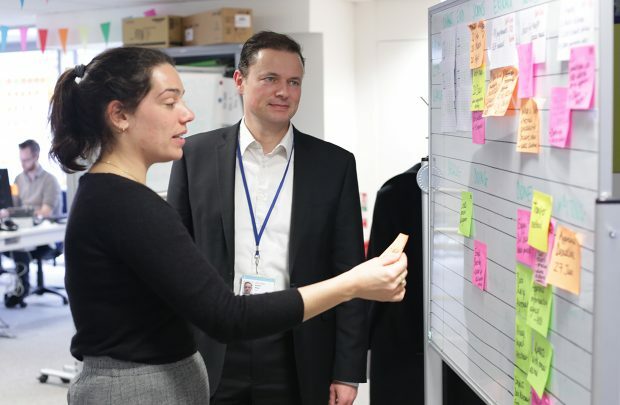 The successes and lessons learnt from this pilot have provided valuable evidence for DWP and wider government in our move towards more user-centric services. There are many cases across the private and public sector where this type of user-centric trusted attribute exchange could be adopted in future to create better, faster services, reduce costs, improve how we use data, and reduce risk while increasing citizen confidence in government's use of their data to deliver the services they need.